My mother swears I came out of the womb dancing. Obviously, I don’t remember that exactly, but I do remember that I have always had a certain passion for moving with the music. My mother enrolled me in dance lessons at age four in order to let out some of my persistent energy. From that point forward, I lived, breathed, and slept dance, developing what may be called the dancer identity. Twenty happy years go by, and I suddenly begin to question the identity that I had worked so hard to develop as I was growing up. Maybe it was the constant battle against my weight. Maybe it was the ever-persistent ankle injury. I just got weary of it all. I’m not really sure how it happened, but one day I woke up and I realized that dancing isn’t what I wanted to do anymore. Questions began running through my head: What will I do? What kind of person will I become? Will I be labeled as just another dancing failure? Who am I, and who will I be now that I am not a dancer? Leaving the dance world is not easy. It is a complicated matter to walk away from a life that one has spent the past twenty years bleeding, sweating, and crying for. I felt bewildered and confused. I felt that I was left with no identity at all; I felt like a blank sheet of paper. The hardest part was I felt that I had truly disappointed those that were behind me while I was dancing: family, friends and teachers, all of whom had bled, sweat, and cried with me along the way. Did they think that I was a failure? Am I a failure? It’s funny how we think of an identity as a single unit, when in reality it is multi-faceted, pulling together all of the things that make you who you are. I learned this lesson the hard way, yet realizing it made the transition from the dance world just a little bit easier. The dancer identity has many layers. Some are positive (graceful, strong, beautiful), some negative (poor, insecure, dumb.) Leaving the dance world is easier to bear when you realize that you can hold on to the positive parts of the self formerly labeled under the heading “dancer” while eradicating the negative parts that you never personally identified with anyway. Body stereotyping and an uncertain future were parts I was glad to scurry away from. The disciple I developed over my life through dancing is helping to secure my new future; the one that I know was meant to be. I will always have been a dancer; it will always be a part of my identity, although I may for now also be identified as a student, a writer, and a part-time waitress. I have no idea where my life will take me, or what parts of my identity remain to be seen. But no matter where I end up, I’ll be smiling on the outside and still dancing on the inside. 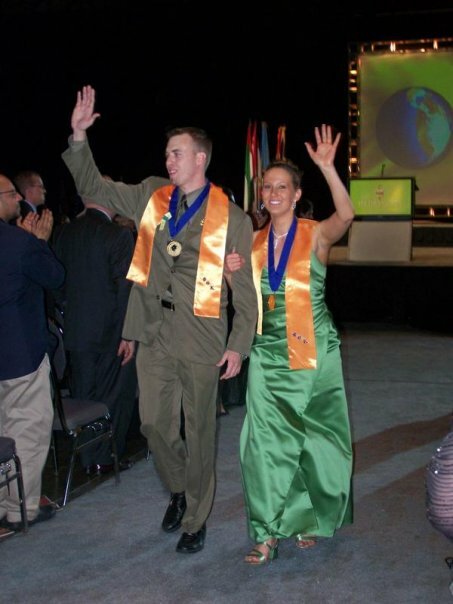 Image in this post is of the author as Phi Theta Kappa International President – 2008-2009.